It had to happen this way: Keegan Messing finding an endlessly adventurous way to prepare for a figure skating competition. There are no straight lines in his approach. He has swung up ladders with heavy merchandise on his back, hurled his way up tall poles, Leaped across a mountain peak or two, picked through the parts of an old jalopy to make it run, huddled with a Husky, paddled to an iceberg. But this one takes the cake. In the week before the Grand Prix Final last month, Messing had to find his feet as a 7.0-magnitude earthquake hit home in Anchorage, Alaska and rattled the land all around. He had already endured a magnitude-8.0 earthquake that occurred 100 miles north of Anchorage, so the shaking wasn’t as severe as the one last month. “We get earthquakes up here quite a lot so when they happen, you just kind of brush them off,” Messing said. But he was able to brush this one off, he said, because everybody that he knew was safe. Considering the amount of damage done to the city, there were no casualties. The earthquake hit at 8:29 a.m. November 30, with the epicentre 10 miles north of Anchorage, shuddering the earth from a depth of 29 miles. The Grand Prix Final – Messing earned a spot when Yuzuru Hanyu had to withdraw – took place from Dec. 6 to 9 in Vancouver, only a week later. Messing lives three miles away from his rink in Anchorage, and it was the only rink in the town of 300,000 that did not shut down. Others needed repairs. Roads fell apart. Fissures split the earth. Walls cracked. One home collapsed. Messing was home when the earthquake struck and his apartment shook for a little more than a minute. 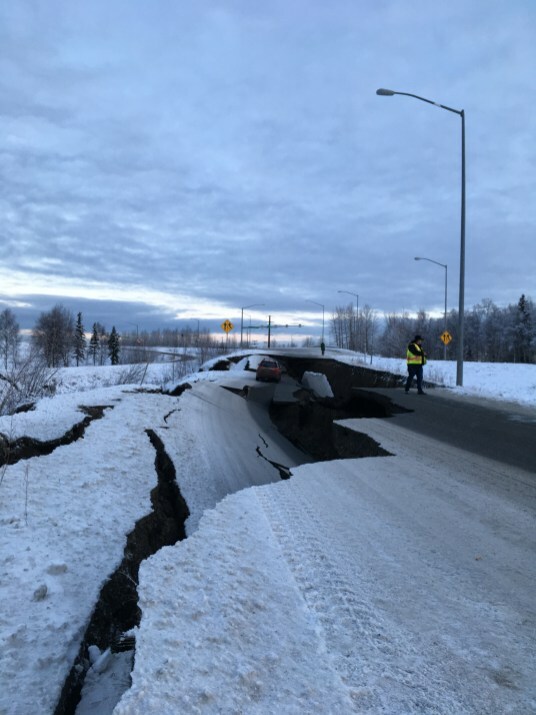 The shaking continued for two minutes in other parts of Anchorage. “About 10 seconds into the shaking, all the power went out, too,” Messing said. And because it was so early in the morning, and Alaska has such long nights at that time of year, it was pitch black outside. “So you could just hold on in the dark and just listen to everything destroy itself,” he said. And the city is still experiencing tremors. Three days after the quake, the area had endured 3,000 aftershocks, and now the count is up to more than 6,000. A few days ago, the area had another 5.0 aftershock. “It caused a lot of us to look up what an aftershock is, and why it’s not considered an earthquake by itself,” Messing said. In 1964, Alaska suffered the second highest quake ever recorded in the world: 9.2. That quake prompted Alaskans to shore up their buildings and make earthquake plans. Within days after this latest rumble, they had fired up an asphalt plant and at least temporarily repaired the paved roads that had been severely damaged by the quake. It meant Messing could make it to the airport. 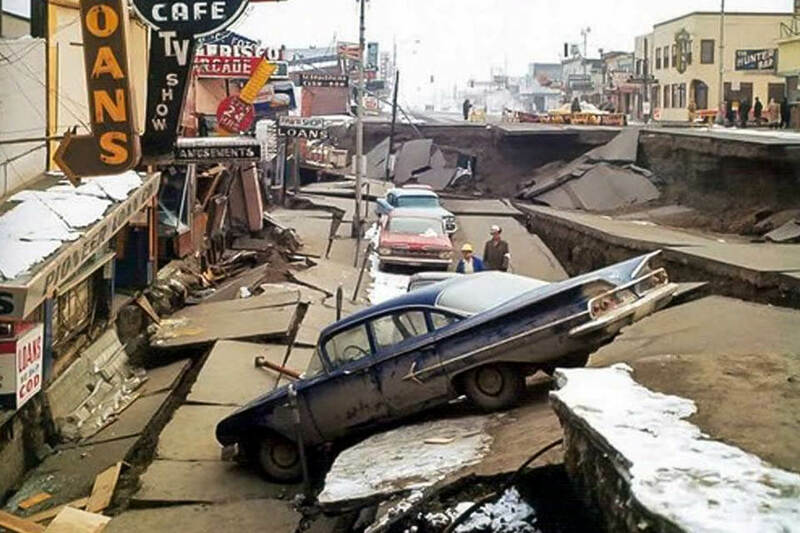 Anchorage after the 1964 earthquake, second largest in history. Messing posted a photo on his Instagram page of a car stranded in the middle of a buckled road, only five miles from his apartment. 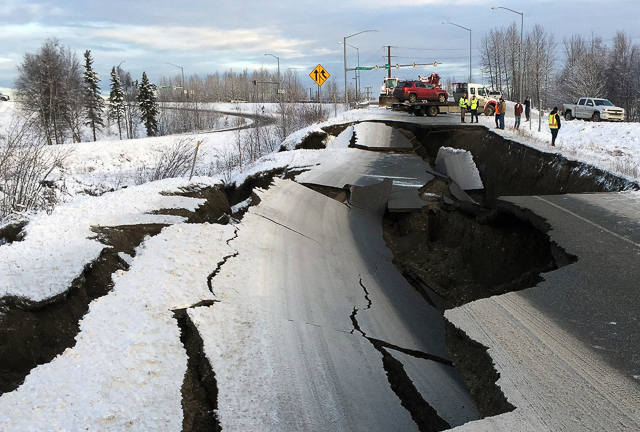 He also posted a photo of another damaged roadway close to home, which actually was the road he travelled so many times from his hometown of Girdwood, a 40-minute drive from Anchorage. For 15 years, Messing’s mother, Sally, drove her son to the rink in Alaska on the road. For another six years, Messing drove himself on that road, a two-lane road that he says is considered a very dangerous one. So Messing and coach Ralph Burghart called an audible; They left several days earlier than they had planned so that he could train without interruption in Vancouver. He wasn’t supposed to leave until Wednesday, Dec. 5, but he left on the Sunday evening (Dec. 2.) He got to practice in Vancouver with three Japanese girls. “It was a great experience,” he said. As for the Grand Prix Final, he finished fifth, but landed a quad Lutz in competition for the first time. You probably will not see it at the Canadian championships this week in Saint John, N.B. He’s been breaking in new boots lately and although they are working well for him and he has landed a couple of quad Lutz in practice, he’s going for consistency on his other quads and on his triple Axel. He’s the top candidate to win a national title. And what a road he has travelled this year. As usual, it has been unusual. He sizzled through the short program at Skate Canada, with a HUGE score of 95.05 that bettered Shona Uno. And then he won the silver medal overall, his first Grand Prix medal. Russia was another story, and it was back to adventure. Travel from Alaska is always complicated and long. It took him 31 hours to get to Russia and then he had to deal with a 12-hour time change. “It was a big trip for me,” he said. He had only 1 ½ hours of practice before he competed, and ended up fifth. He’s learned from that interminable trip. Believe it or not, to fly from Anchorage to Saint John would take 24 hours, what with all the connections and he’s not crossing oceans. So he’s coming to spiff up his choreography with Lance Vipond in Brantford for a few days, before he climbs into a puddle jumper to New Brunswick. Because of his successes in recent months – don’t forget that eighth place finish at his first world championships – Messing and his joyous routines have been in demand for shows. He was home for only two days after the Grand Prix Final before he had to jump onto a plane and do a show in Germany. Then he was home for three days before he was off for another show, all while skating in brand new boots. He got sick when he returned from Germany, a lung, throat kind of thing that wasn’t serious, but just enough to take the wind out of his sails. “Just enough to lose momentum,” he said. He had to work a little harder with the training to get his conditioning levels back up. “We had a lot of offers for the Christmas season and leading up to nationals,” Messing said. “We had to turn down quite a few shows this year because of the lead-up to nationals.” Had he done the shows, he would have had only this week to train. And it wasn’t enough. He wants to make sure he is ready.